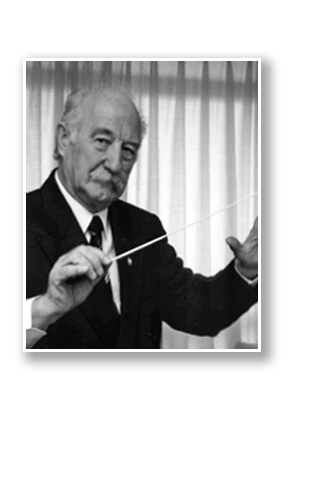 In 2007, the Concert Band was pleased to welcome back Bobby Herriot as conductor after a four-year hiatus. Bobby Herriot is originally from Edinburgh, Scotland, and came to Canada in 1957. He and his wife Etta now reside in Burlington, Ontario. His instruments are trumpet and piano, and his formal music study was at the Royal Military School of Music (Kneller Hall), the Royal Academy of Music, the Royal College of Music in London, England and the Canadian Forces School of Music in Victoria, BC. Before coming to Canada he served in the Bands of the Blues & Royals. His service with the Canadian Forces (from which he retired with the rank of Lieutenant Colonel) included stints with the Royal Canadian Air Force and the Royal Canadian Artillery. During this period of service he was Trumpet Soloist and Assistant Conductor with the NORAD Band in Colorado Springs, Colorado. This band consisted of members of the U.S. Air Force, the U.S. Army, the U.S. Navy and the Royal Canadian Air Force. It was the only multi-unit international band in the world. In the period after in military service, Bobby performed with the bands of Buddy Rich, Stan Kenton, Xavier Cugat, Lionel Hampton as well as with the Boss Brass, the Howard Cable Orchestra, Peter Appleyard’s Swing Fever Orchestra, the Harry Waller Orchestra and regularly with various other orchestras and bands, in theatres and recording sessions in Toronto, New York, Los Angeles and Vancouver. Bobby Herriot recently retired as the Vice President from Canada of the American Federation of Musicians of the United States and Canada. In addition to the Hamilton Concert Band, Bobby is also currently conducting the Thornhill Concert Band and the Ambassadors Jazz Band. His present activities also include writing special arrangements and compositions for concert and jazz bands. Bobby retired from conducting on a full-time basis in the spring of 2014, so that he could spend more time arranging and writing music, accepting more guest conductor appearances and especially to spend more time with the love of his life, Etta.